Sakigake!! 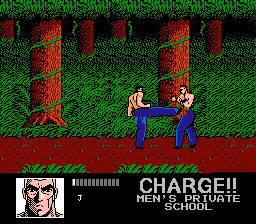 Otokojuku: Shippuu Ichi Gou Sei is an action beat ‘em up game for the Nintendo Entertainment System. 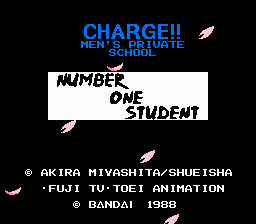 This is the Fully translated English version of the game Charge!! 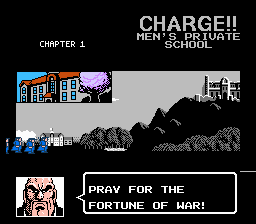 Men’s Private School. 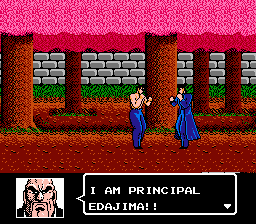 The game is based 1988 Japanese Anime series Sakegake!! Otokojuku. It’s about a private school for juvenile delinquents that were previously expelled from normal schools. At this school, Japanese chivalry is taught through feudal and military fundamentals. Special thanks to lancuster for requesting this translation.